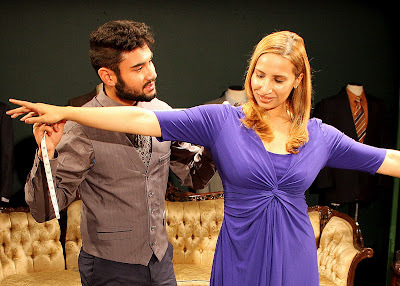 Srin Chakravorty & Steve Auger in "Vicuna"
For the opener of its final season, Zeitgeist Theatre Company is presenting the New England premiere of the revised play Vicuna by Jon Robin Baitz (Other Desert Cities), a choice that is as timely as it is “suitable”. A celebrated Iranian Jewish immigrant who has become a celebrity tailor, Anselm Kassar (Robert Bonotto) serves famous, wealthy, and powerful clients. He finds himself trying to accommodate a very unusual one: a real estate tycoon and reality television star conveniently named Kurt Seaman (Steve Auger), short on substance but long on bluster, who, to universal surprise, is nominated by a major party for the office of the President. As the campaign spirals out of control, including in its vortex the candidate's daughter and campaign manager Sri-Lanka Seaman (Srin Chakravorty) and conservative Senator (and RNC Chair) Kitty Finch-Gibbon (Evelyn Holley), Kassar and his Iranian Muslim apprentice Amir Masoud (Jaime Hernandez) are forced to examine their complicity (as confidants and image-makers) and whether just the right suit has the power to win a debate and ensure the presidency. There are serious choices to be made, from a set of possible collars to the luxuriousness of the fabric. The play received its world premiere in Los Angeles two weeks before the 2016 election. Afterwards, Baitz revised the work to reflect the horror that had transpired in the election, which he called The American Epilogue, in the form of a brief prologue and extensive epilogue. What can one say about this depiction of a national presidential campaigner whose slogan is, “Seaman loves women and women love Seaman”? But such sleaze could of course never happen here, right? Jaime Hernandez & Srin Chakravoty in "Vicuna"
Though real names are eschewed, perhaps for legal reasons, it's never unclear about whom the playwright is expounding, with unsubtle references to a pant-suited female opponent and the like, and therein lies a problem with this work. One is never quite sure what is intended as commentary and what is meant as satire. Difficult as it is to satirize what is in reality already a parody, the play ricochets from serious political polemic to surreal fantastical farce. In fact, it could be said to be two distinct plays, or at least representing two distinct yet related points of view. The small but largely impressive cast of five are a treat to see and hear (though several could profit from an increase in volume), from Auger's horrific bombast to Bonotto's patient wisdom, to Hernandez's passion, to Chakravorty's conflict, to Holley's deal-making. While it's surely not on a par with his previous works, Baitz presents some intriguing and original twists and turns, none of which will be revealed here. Suffice it to say that the author has enough creative concepts for any two plays, including a sight gag or two and a modern take on The Emperor's New Clothes. And who knew vicuna was going for a couple thousand or three per yard these days? 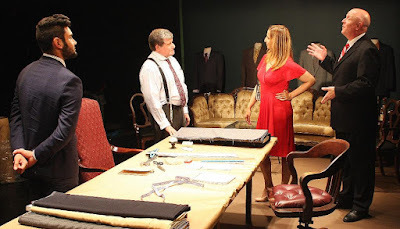 Jaime Hernandez, Robert Bonotto, Srin Chakravoty & Steve Auger in "Vicuna"
Speaking of clothes, for this production, the crucial Costume Design was by Elizabeth Cole Sheehan, with Lighting Design by Michael Clark Wonson, and Sound Design by J. Jumbelic. As has been the norm for Zeigeist, the Direction and Scenic Design were by David Miller, the company's founding Artistic Director, who previously had announced that this will be the company's last season. It is fondly hoped that Miller will resurface in future directorial and other roles, as both he and his edgy and challenging repertoire will be sorely missed. This, their penultimate production, “bespokes” well for the one remaining offering this spring, Trigger Warning, a world premiere by Jacques Lamarre. In the meantime, one could ponder the warning which the character of Seaman bloviates: “There's only one American dream left, and that is to take what's left”. Then why are we still laughing? Find out at the Black Box Theater through October 6th. Odyssey Opera's "Reine de Saba": Just Desserts?